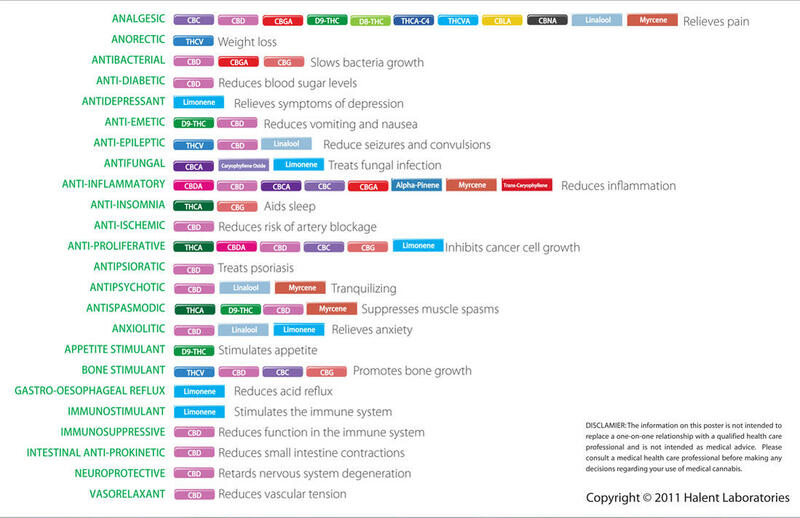 See an updated version of this post on The Leaf Online,Cannabinoid Profile – CBG! 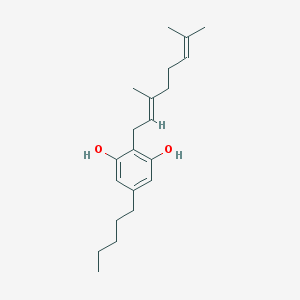 Cannabigerol (CBG) is not considered psychoactive and is known to block the psychoactive effects of THC. It has been shown to stimulate the growth of new brain cells and bones. Neurogenic compounds are extremely rare which makes CBG a very worthwhile subject for more research. CBG also is antibacterial, anti-tumor, and aids with insomnia. It is effectively impossible to overdose on CBG; it usually exists only in trace amounts in a processed plant, this makes the already very high LD50 of 22.44g/kg even less. CBG is considered a ‘stem cell’ cannabinoid and can change into different cannabinoids, altering the overall effects of the plant. Some of these cannabinoids CBG morphs into are THC ,CBD, and CBC which all share the same molecular formula but have a different structure. Bone Stimulant – Promotes bone growth. Neurogenic – Helps stimulate the growth of new brain cells. Glaucoma: A 2009 study found both CBG and THC to be very effective for relieving the intraocular pressure from glaucoma. This is an area that will undoubtedly be receiving more research in the years to come. Inflammatory Bowel Disease: Much like CBD, CBG shows a lot of potential for controlling the inflammation that leads to IBD, and like CBD warrants further research. Painkiller and Anti- Inflammatory: Recent research suggests that CBG has anti-inflammatory and analgesic properties and recommends further study. 5-HT1a Receptor Agonist/Antagonist? : CBG appears to do something at the 5-HT1a receptor that is not fully understood. It modulates how other cannabinoids affect us especially at this brain site, which is the hub of emotions and depression regulation in the brain. Depending on the study evidence suggests that CBG may help your depression and anxiety, or possibly block certain anti-depressant drugs. One study in rodents showed that if the right combination of CBG and CBD were present the CBG would block some of the anti-nausea effects of the CBD, but it could not quite identify why (other than it related to the 5HT1a receptor). Dravet Syndrome/Seizures: Anecdotal evidence and some current studies suggest that CBG may be beneficial to patients with Dravet and other seizure conditions. A new tincture was just released at Harborside Health Center which is the first CBG-rich tincture on the market. This tincture, named Jayden’s Juice after Jayden David, the young boy with Dravet syndrome made famous by Weed Wars, is currently what Jayden is using to combat his seizures instead of a purely CBD rich tincture. A study from earlier this year also suggests that CBG may help with seizure management, but the mechanisms aren’t fully understood. *Note: Decarboyxlation – A chemical reaction that removes a carboxyl group and releases CO2, often triggered by heat.